The flowering plants are a large group of seed plants that called Angiospermae , as their seeds develop within a pericarp , They are common in various habitats and vary in the size from small herbs to giant trees , The flowering plants reproduce by specialized organ which called the flower . Flower is the reproductive organ in the flowering plants and it is a short stem whose leaves are modified to form the various floral parts , Bract is a leaf that from its axil the flower emerges , It varies in the shape and colour from a plant to another ( scale , green ……… ) . With a bract or without a bract . Stalked ( carried on a pedicel ) or Sessile ( not caaried on a pedicel ) . Solitary flowers : which may be Apical , so that it stops the growth of the stem as in tulip flower or Axial that doesn’t stop the growth of the stem as in Petunia flower . Grouped flower : Flowers arise grouped on the floral axis in various aggregations which called inflorescences as in the flower of bean and manthur , Inflorescence is a group of flowers on the floral axis in various aggregations . Calyx ( outer whorl of the flower ) consists of green leaves that called sepals , It protects the inner parts of the flower againt drought or rain or wind . Corolla ( follows the calyx from inside ) consists of one row or more of coloured leaves that called petals , It protects the floral sexual parts , It attracts insects for the occurrence of pollination process . Androecium ( flower male organ ) consists of numerous leaves that called stamens , where each one of them consists of filament that carries an apical anther , anther contains four sacs of pollen grains , It produces the pollen grains ( male gametes ) . Ovary : the swelling base of the carpel and contains the ovules . Style : a thin neck that attaches over the ovary and ends with the stigma . Stigma : a sticky disc where the pollen grains adhere . In the flowers of most monocotyledon plants as tulip and onion , the leaves of calyx are difficult to be differentiated from those of the corolla , and so the two outer whorls are called perianth . 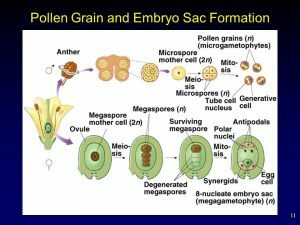 During the flower development and before the formation of pollen grains , these sacs are full of large-nucleated diploid cells ( 2n ) called the mother spore cells . Each cell of these mother spore cells divides meiotically , forming four haploid ( n ) cells called the microspores . The nucleus of the microspore divides mitotically into two nuclei , where one of them is called the tube nucleus and the other called the generative nucleus , therefore the pollen grain is formed , then its wall becomes thick for its protection . The anther becomes mature and the separating wall between each two adjacent pollen sacs degenerates , then the sacs open and the pollen grains become ready for dispersal . The ovule starts to appear as a simple swelling on the interior wall of the ovary and it contains a large mother spore cell ( 2n ) . During the ovule growth : A funicle develops which connects the ovule with the ovary wall and through which the nutrients reach it , Two integuments develop which surround the ovule completely , except at a minute hole called the micropyle through which the ovule is fertilized . The nucleus divides mitotically for three times , giving 8 nuclei , where each four of them migrate to one pole of the embryonic sac . From each four nuclei , one nucleus moves to the centre of the embryonic sac which are called the two polar nuclei ( embryonic sac two nuclei ) . Each nucleus of the remaining three nuclei at each of the embryonic sac poles becomes enveloped by some cytoplasm and a thin membrane , forming distinct cells . The middle cell of the three cells that are close to the micropyle grows to become the egg , while the two side cells are called synergids and the three cells that are distant from the micropyle are called the antipodal cells . The ovule becomes ready for fertilization . Natural (Non-specific or innate) immunity, How does human body protect itself from pathogen ?